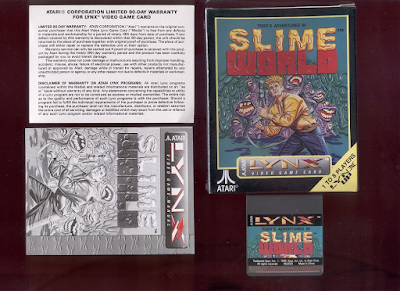 Do I need another copy of the excellent, technical impressive and wildly innovative Slime World for my Atari Lynx collection? Probably yes, but that'd be my third copy and thus a clear overreaction. You on the other hand --and by you I do mean people without access to the game-- simply need to go and bid on this Todd's Adventures in Slime World (Atari Lynx) eBay auction. The game comes complete in its original box with cartridge, manual and warranty card. Seller ships worldwide.